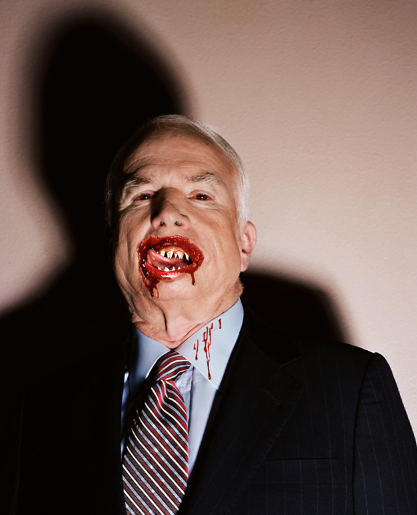 Noted photographer Jill Greenberg is in trouble for photoshopping outtakes from an Atlantic Monthly cover shoot featuring John McCain and publishing them on her website. (Whew! Mouthful!) Seems like Greenberg has crossed a professional line by using the detritus from a paid project to defame the subject of said project. Ya dig? Anywho, BoingBoing has the scoop (and detailed instructions on how to view the rest of Greenberg’s pictures), but we Prerogatives thought that Jill’s pics make a perfect GroupThink (and maybe even provide a delightful visual correlary to our shamelessly leftist viewpoints). Without further ado: unleash the hounds. CerealMom: Sarah Palin says we are ALL God’s creatures, from unborn to undead. StyleBaby: The virginal brides file past his tomb / Strewn with time’s dead flowers / Bereft in deathly bloom / Alone in a darkened room / The count / Bela Lugosi’s dead. MiddleChild: I don’t get it.